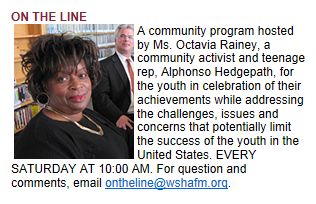 Special thanks to WSHA Radio and the On The Line show and host Ms. Octavia Rainey — I heard about a City of Raleigh youth development initiative that should be considered for a national model. The initiative founded in 2011provides services 7-days a week to all the youth of the city at The Saint Monica Teen Center. According to the website the St. Monica Teen Center is the first teen center operated by the City of Raleigh and provides a wide range of programs and opportunities for the teenagers of Raleigh! The facility houses a state of the art technology room, teen lounge, fitness/dance room, multipurpose classroom, wall of history, and homework area. Activities include dance and music classes, homework assistance, fitness programs, computer lab, Teen Advisory Board, educational programs, and more! The Saint Monica Teen Center is open to ages 13-19 who are currently enrolled in a middle or high school and will require membership. Membership requires proper registration forms acknowledging rules, policies, and code of conduct along with signatures from the teenager and parent/guardian. If the teen is under 18, a parent/guardian signature is required. The Information Technology department collaborated with the City’s Parks and Recreation, Community Development and Community Services departments to provide an innovative technology room in the historic Saint Monica Teen Center. 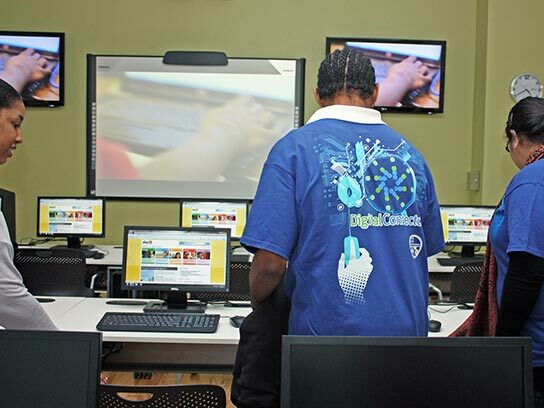 The interactive technology room serves as the home for Raleigh’s Digital Connectors training program.